Cambridge Audax promotes long-distance rides from Cambridge, particularly audax rides. Audax is an endurance cycling discipline, like fast touring, but with a time limit. Audax distances are tough, but well within reach of any club riders and most active amateurs. You're only trying to beat the time limit and yourself, positions don't matter, take as long as you want — within the time limit — and take any route you want via the controls or checkpoints — we give you clear, easy-to-follow routesheets as well. 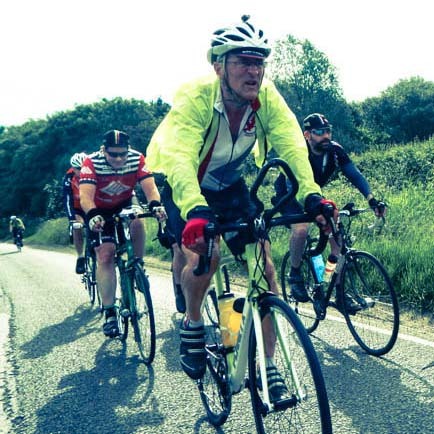 The audax community is wide-ranging with regular riders from all walks of life, both men and women, aged 15 to 85! Use any human-powered transport you like, there's no need for an expensive racing bike. When you ride audax, you will also discover you're capable of more than you ever thought. Sportives are for people who like to pretend they’re racing; audax is for people who like to pretend they aren’t! Enter a ride and give it a go — we are finding and creating rides of different distances and difficulties around Cambridge, so you should always find something new to challenge yourself with. On completion, your efforts will be recorded on Audax UK's finishers' lists so you can keep track of your achievements. Navigation is straightfoward, distance is everything … and cake, almost more than you can eat! We think many cyclists would enjoy the endurance aspect of audax as much as the sprint-for-the-line of a club run; we think they just need a bit of encouragement to give it a go. With these Cambridge routes, riders can start close to home and ride hundreds of kilometres of new rides.